he Slimfold was a very small and — slim — Duofold made. Like the rest of the British Duofold collection of the 1960's it came in the four solid colours of Black, Red, Blue and Green, the green being the most uncommon. It was 113 millimeters long and had a small gold nib, a gold plated arrow clip with the feathers being very narrow, and also a narrow gold plated cap band with engraved chevrons. Regarded a ladies pen it's an excellent writer with the modified "U" aerometric filler. Some early models also had a single digit denoting the year of manufacturing. he cap of the Slimfold was re-designed in the late 1960's and became very similar to the Parker "45", with a "45" style clip, a straight cap and a thin gold filled cap lip. And in late 1971 the New Slimfold was introduced, also made in the UK. It was re-designed much in the manner of the Parker "45", but shorter, 122 millimeters with the cap on, as compared to the Parker "45" which was 136 millimeters in lenght. It also had the Parker "45" nib assembly and clip and since both pens are cartridge fillers the most significant difference is the screw-on cap of the New Slimfold, as opposed to the slip-on cap of the Parker "45". The cap had the imprint Parker/Made in England but when the chalked NEW SLIMFOLD have been brushed away, it could be very hard to identify the pen. 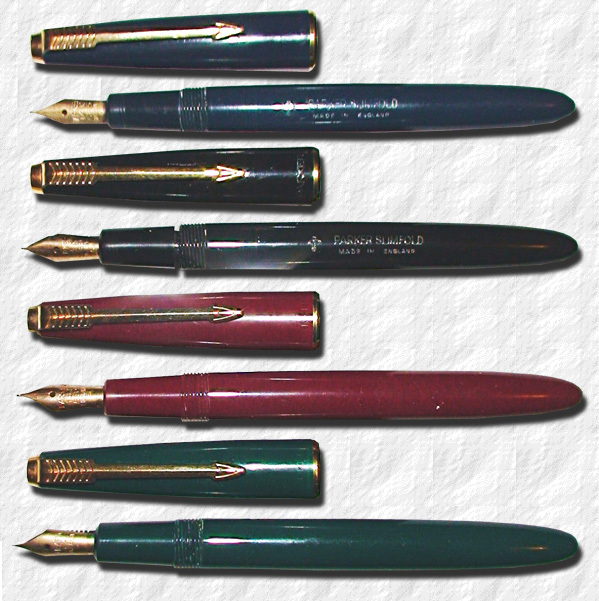 Even though virtually unbreakable and sturdy writers as well as often being fitted with nice semi-flexible nibs, the British Duofold collection has somewhat failed to capture the minds of the collector community, save the Maxima which is very much sought for, but the rest of the line can still be found relatively cheap. Their only fault is a tendency to discolour if left for a long time in direct sunlight. The Slimfold was discontinued in 1975. The line was also manufactured in Denmark, denoted by the Christian Olsen anchor.